Dr. Maddahi directing a stress test. Dr. Maddahi may recommend stress testing at his Los Angeles practice when determining if you have blocked arteries. The most common nuclear stress test techniques used for cardiac imaging are single photon emission computed tomography (SPECT) and positron emission tomography (PET). A radioactive tracer is injected into a vein that can be tracked to see where blood flow may be lessened or impaired by plaque. This tracer is injected immediately after exercise, and your body is scanned. An additional scan is done with the heart at rest. Because coronary artery disease (plaque in arteries) has no initial symptoms, it is important to have your arteries checked. The tracer will distribute evenly in the heart where there are no obstructions. If there are obstructions, the tracer will show the lack of blood flow to the area of the heart that is blocked. Dr. Maddahi will compare the differences between your two scans. If there is minimal blockage, the two scans, with exercise and at rest, will look similar. These stress testing scans have proven to be an excellent detector of coronary artery disease and are available at our Los Angeles office. Before your stress test, the friendly staff at our Los Angeles office will provide instructions that are tailored just for you. We ask that you tell us about any medications (prescription or over the counter) you are taking. Additionally you should let us know if you are taking antacids, and vitamins or supplements. We will also need to be advised of any medical devices, or implants you may be using. Dr. Maddahi will provide advice on continuing medications, and if there are any precautions for devices. For your nuclear stress test, electrodes will be placed on your chest, and a blood pressure cuff will be attached to your arm. An IV line will be placed in your arm so that we can inject the tracer. You will be asked to walk on a treadmill while the incline of the machine is gradually increased. We will be recording your body's responses to the stress of exercise. During the exercise let us know if you experience any chest pain, shortness of breath, nausea or unusual sensation. Once you feel you have reached your maximum endurance on the treadmill let us know. The tracer will be injected into the IV line. You may be asked to walk for a few minutes more so that the tracer has time to circulate through your body. You will then lie flat on a table, and your body will be scanned. During this time, it is essential that you remain still as moving around will blur your images. We will scan your body while at rest. For this portion of the test, you will again be injected with the tracer and your body will be scanned. This test may be performed in one visit or may be ordered over two separate appointments. 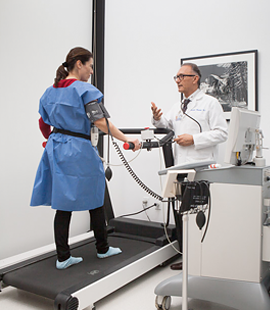 During stress testing the activity of your heart is recorded and analyzed by Los Angeles heart specialist Dr. Maddahi. If any abnormalities are found, Dr. Maddahi will prepare a plan to get you on the right track for a healthy heart. Call us with any questions or concerns you have about your nuclear stress test. Dr. Maddahi and our staff will work to make sure you understand everything you need to know to have a successful result. Dr. Maddahi has a proven record of changing the direction of heart health. Even patients with a family history of heart disease have benefited from Dr. Maddahi's guidance to ensure you have an exceptional quality of life well into old age. If you have a family history of heart disease Dr. Maddahi would like to see you in your mid 30's. Early detection is your best bet for a successful program of prevention. With all of today's technology behind him, Dr. Maddahi will help you to reach your health goals.